The first time I mentioned making this cookie to my kids, they were not all that enthusiastic about me baking them. After making all the basic cookies that I could possibly find, it was time to venture out of my comfort zone and try something new out. Never would I have thought, to mix oatmeal and coconut with white chocolate. That just sounds like the weirdest combination I have ever even heard of. After some thoughtful consideration, my oldest looked at me and said “Mom, don’t knock it until you try it”. So that’s what I did. I made up a batch of Cranberry Coconut Oatmeal White Chocolate Cookies. Whew, that’s a mouthful. When I think of a cookie, I think of something that is soft and chewy, with chocolate oozing out of every bite and it fits perfectly in a cold cup of milk. I will also be the first to tell you, that when I think of a cookie, it does not include coconut or oatmeal. After baking this mix, I tell you, I am seeing coconut and oatmeal in a whole new perspective now. Who would have thought that all of these flavors would mingle together and create a cookie that is not only soft and chewy but dunks perfectly into a cup of milk?! Are you ready to try them out? I hope you enjoyed my Cranberry Coconut Oatmeal White Chocolate Cookies as much as my family and I did. If you make it, make sure to share with us on Facebook or Twitter! Also, check out all of our other Recipes. Preheat oven to 350 F. Lightly grease or line a cookie sheet. In a large bowl, cream butter and sugar with an electric mixer until light and fluffy. These look great and delicious; I love how you’ve changed up the traditional Oatmeal Cookies with coconut and white chocolate. These sound really good and a great way to use up my dried cranberries, thanks for the great recipe!! What a delicious-sounding combination of flavours – all in one cookie! These would be so good. 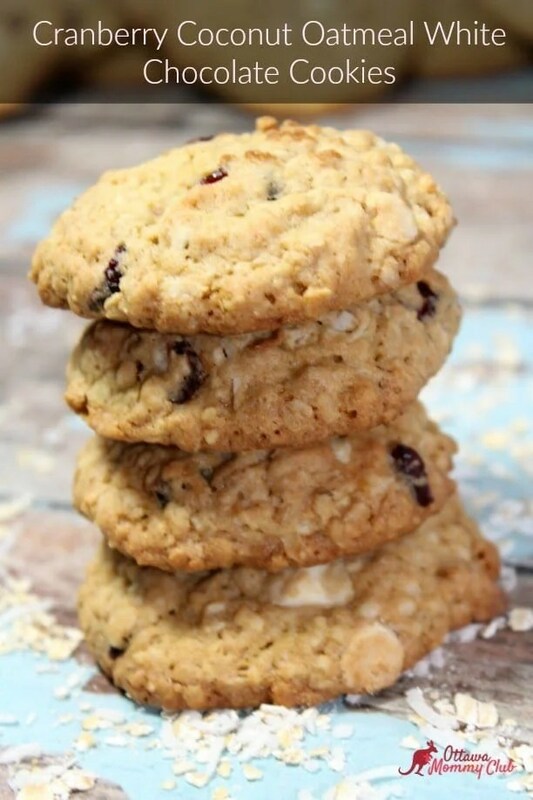 I love dried cranberries in cookies and coconut is yummy with oatmeal. This sounds so festive! I love that they have cranberries in them! Yummy!!!! There are lots of good things in these cookies.I think I will make them for sure on my next baking spree. You can or just omit it. Looks like a great recipe, not too much butter and sugar. I’ll change to chocolate chips. Thanks. These cookies sound and look awesome. I think I will try these. These look like just the kind we like, I’ll give them a try with chocolate chips. Thanks. Tried these cookies and they are super – made them to go in lunch boxes, but not very many left. Wow I thought I had tried every variety of cookie there is lol these look awesome . I’ll pin it to try later . I love that they have cranberries,they look so tasty!